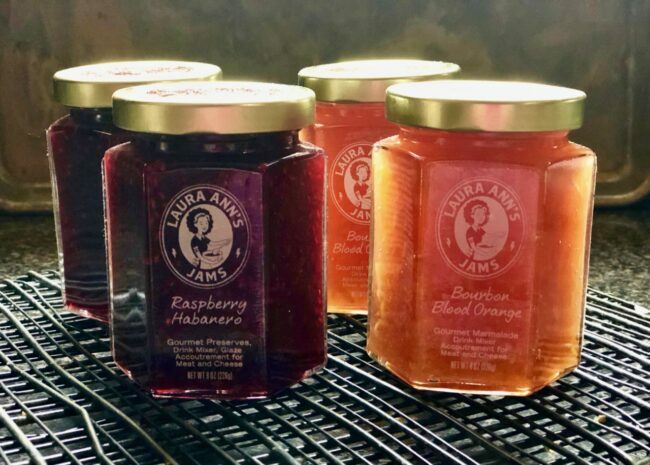 Tom has been obsessed with jam lately … specifically with Laura Ann’s Jams and particularly with her Raspberry Habanero and Bourbon Blood Orange jams. We have been going through peanut butter and jam sandwiches as if we had teenagers in the house. Tom is also adding the Raspberry Habanero jam to his steak marinade and we have even spread those jams on grilled fontina cheese sandwiches. Yum! 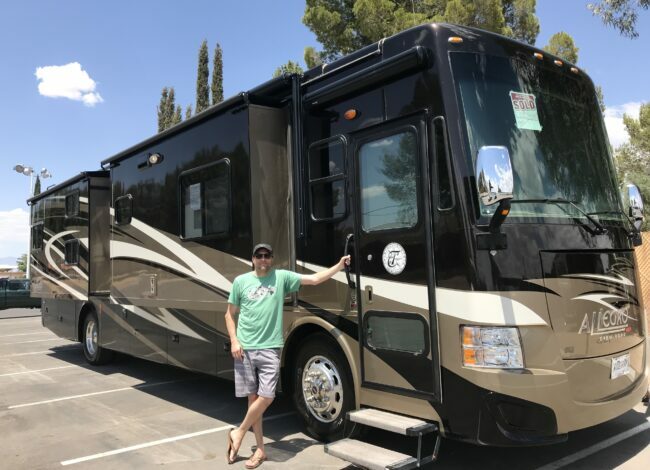 We were introduced to this jam by our friends, Tyler and Sayda, who are currently traveling the United States with their kids and two dogs in a motorhome (a really big motorhome). There was no room for the jam, so Sayda left her large jar of Raspberry Habanero (32 oz.) with us. Thanks, Sayda! 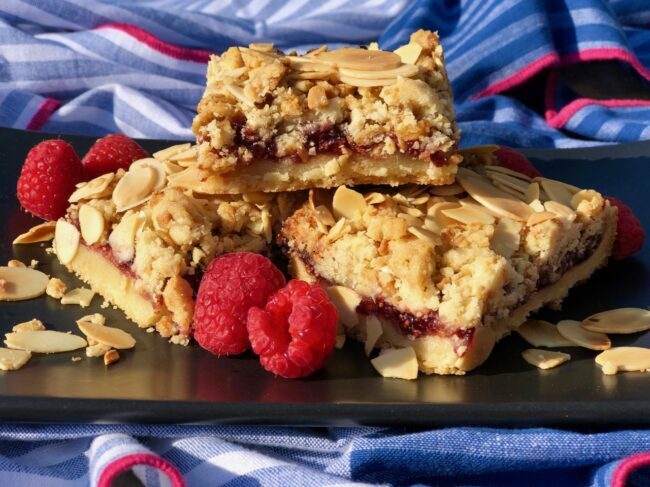 The Barefoot Contessa’s Raspberry Crumble Bars have been on my list to make for some time. Ina’s bars are made with a short bread crust, topped with jam and a granola and slivered almond crumble. Giada’s Apricot Oat Bars, on the other hand, have a more traditional crumble made from Old Fashioned Rolled Oats and walnuts. 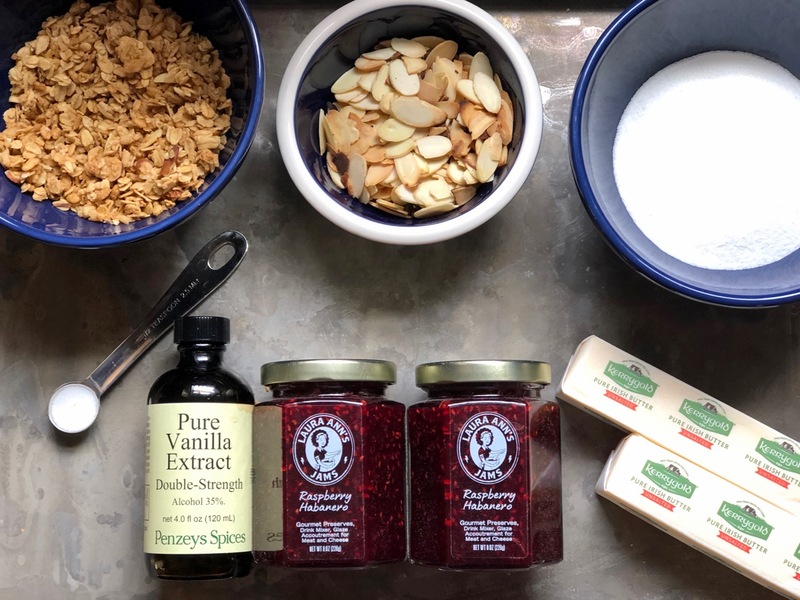 I decided to have a taste test between these two recipes to try to use up the Laura Ann’s Jams before Tom’s Expando belt EXPLODES. You could use any flavor jam or preserves, just be sure it is not too sweet. Ina recommends Hero brand raspberry jam. Giada pumps up the texture of the apricot jam by adding chopped, dried apricots. I liked that idea, so I added dried apricots to the Bourbon Blood Orange jam I am using for that recipe. Both recipes called for leaving a small border around the edge of the crust. Presumably because the jam will melt and ooze out sticking to the pan. That did not happen in either recipe which left portions of the bars light on jam, especially in the corners. As long as your pan is lined with parchment paper so the jam won’t stick, I recommend spreading the jam to the edges and especially in the corners. Oh, I forgot to mention, I got a Kitchen Aid Stand Mixer for Christmas! The raspberry bars will be my first recipe using the new mixer. Maybe I will try some bread next! To my amazement (you know how much I LOVE all recipes from the Barefoot Contessa), I liked Giada’s recipe better. The toasted walnuts and oatmeal crumble was total comfort food and the Bourbon Blood Orange jam with the addition of dried apricots really kicked it up a notch. At the office, the Raspberry Habanero bars won hands down. Everyone loved the hint of heat added by the habanero. 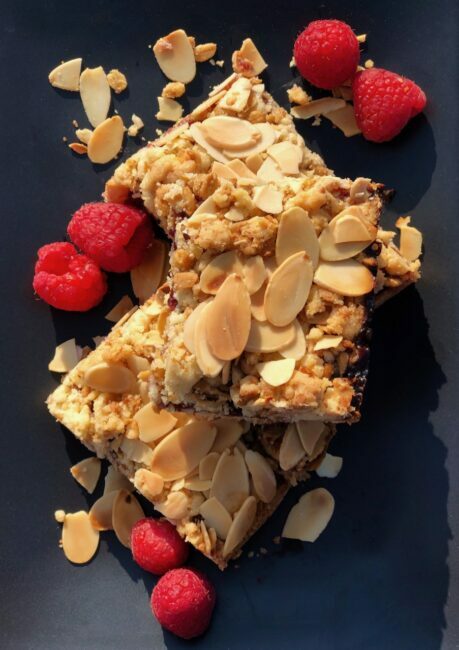 Below is that recipe and here is a link to the Blood Orange Jam, Apricot, Oatmeal and Walnut Bars. Preheat oven to 350°F. 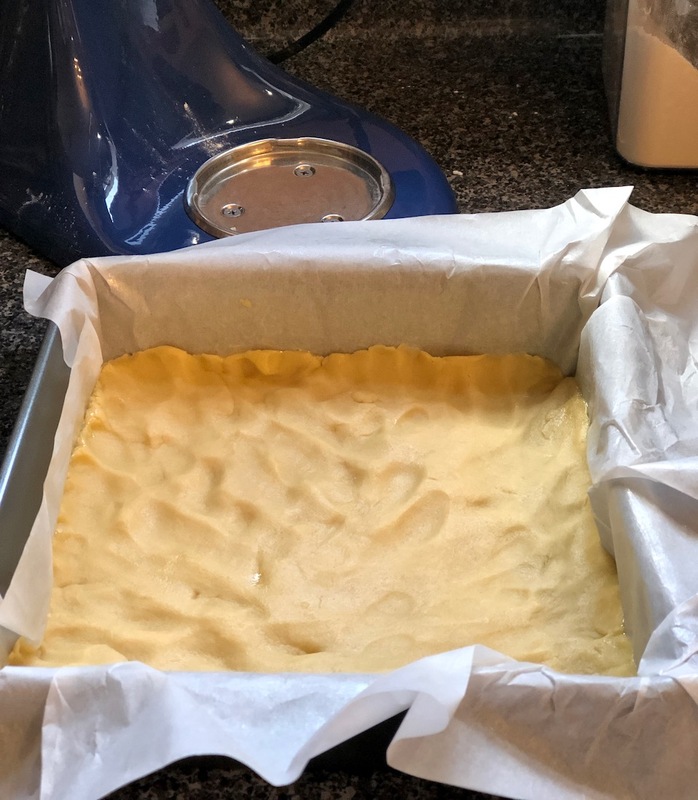 Line a 9-inch square baking pan with parchment paper leaving 2 inches of the paper hanging over the sides to use as handles to lift the bars out of the pan. Spray parchment with baking spray. 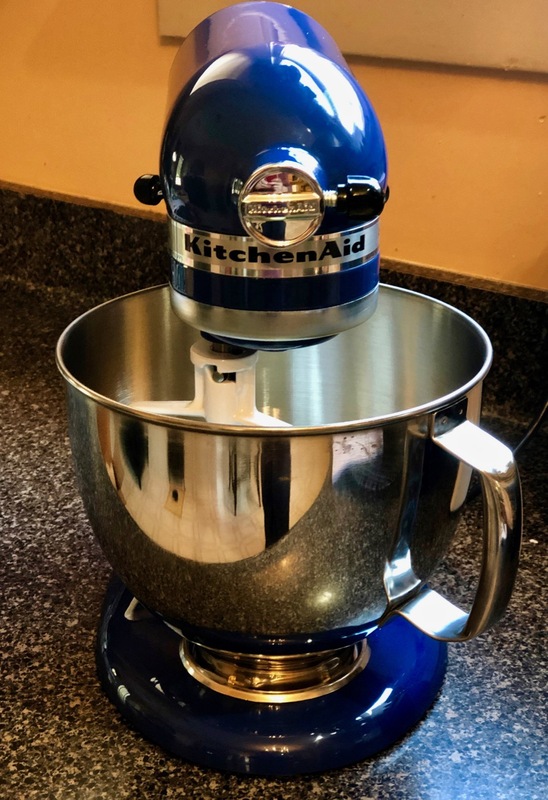 Place the butter and sugar in the bowl of an electric mixer fitted with the paddle attachment and mix on medium speed just until combined (hand mixer works here too). With the mixer on low, add the vanilla. Sift the flour and salt together and, with the mixer on law, slowly add to the butter mixture until it almost comes together in a ball. Turn the dough out on a board. Lightly pat two-thirds of the dough evenly on the bottom of a 9-inch square baking pan and about ¼ inch up the sides. Spread with the jam to the edges (not like my photo). Mix the granola into the remaining dough with your hands. 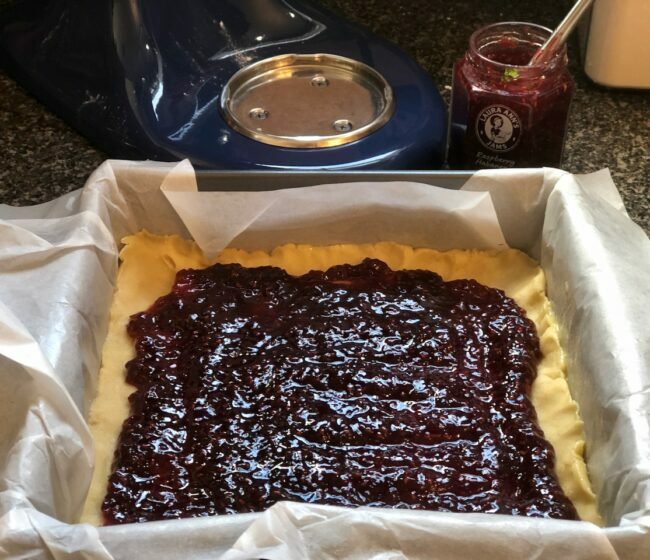 Break the dough into small pieces and distribute it on top of the jam covering most of the surface. Sprinkle with almonds. Bake for 45 minutes, until lightly browned. 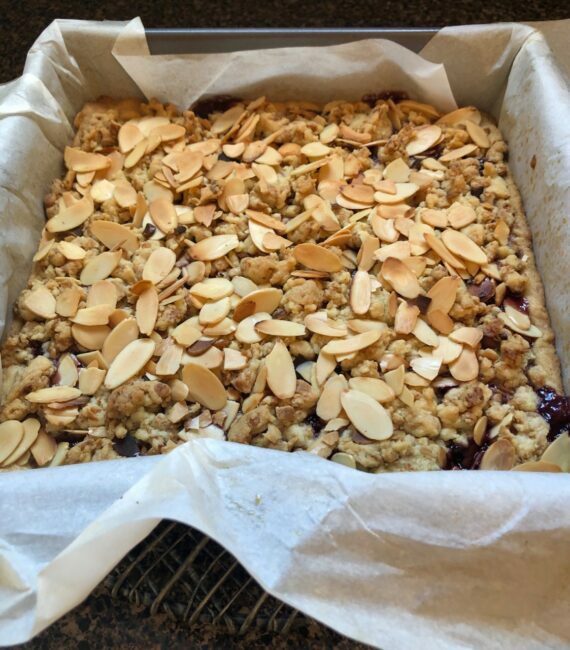 Using the parchment handles, lift the bars out of the pan and let cool completely on a wire rack before cutting into bars. They really do need to cool and set up before you cut them otherwise the jam will ooze out of the bars. 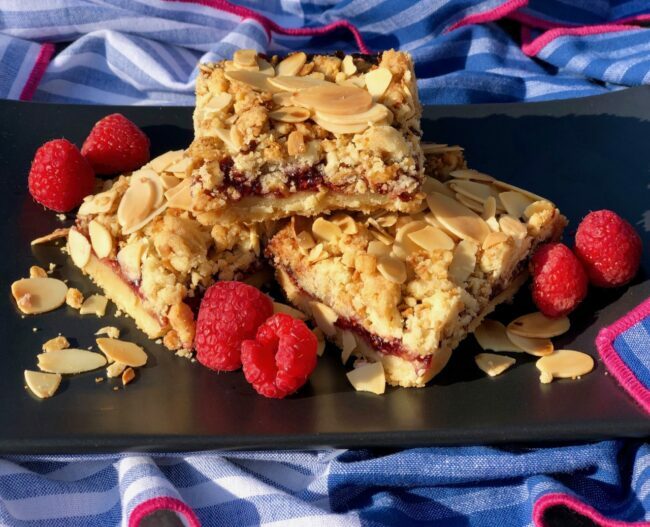 Recipe lightly adapted from Barefoot Contessa Foolproof Raspberry Crumble Bars.